Advertiser.ie - Skin Health – with Omega-3! Whilst expensive creams often promise to deliver miraculous results, there really is no better way to target optimal skin health than by working from the inside. It’s important to remember that our largest body organ, the skin, needs a constant supply of essential nutrients in exactly the same way as other organs do. Omega-3s are incorporated into cell membranes in the the top layer of skin (the epidermis ), forming a protective coat around them, helping to stop moisture being lost, and giving skin a healthy appearance. But Omega 3 fish oils also work deeper in the dermis (skin’s lower layer ) to control inflammation. So whether you have acne or eczema, want to find a natural psoriasis treatment or are simply looking for a plumper, firmer complexion, you should consider adding extra omega-3s into your daily plan. Deficiency of Omega-3 EPA and DHA in the diet contributes to conditions such as dandruff, thinning hair, eczema and psoriasis, as well as age spots and sun spots. Without the essential fatty acids, too much moisture leaves the skin. The healthy fat content of Omega-3 fatty acid works as a barrier to keep moisture in and irritation out. Thus, even when the skin faces dry climate and dulling agents, this barrier keeps it hydrated and healthy. Surprisingly, a massive 89% of Irish people are not consuming sufficient oily fish in their diet, so often there is a need to take omega-3 daily to safeguard your health. Eskimo-3® contains mixed tocopherol vitamin E, vitamin C and rosemary extract to ensure long term stability, resulting in no fishy odours or aftertaste. Omega-3 EPA greatly benefits skin health by regulating oil production to boost hydration and help prevent acne. It also helps to delay the ageing process to stave off wrinkles. A 2005 study in the Journal of Lipid Research discovered that EPA can help block the release of the UV-induced enzymes that eat away at our collagen, causing lines and sagging. Because EPA is both an antioxidant and an anti-inflammatory agent, it can protect against sun damage and help repair it. While the first thing you do is reach for a good moisturiser when it comes to eczema, the case can be made for the importance of nourishing your skin from the inside with Omega-3. In one study, individuals taking fish oil equivalent to 1.8 grams of EPA had a significant reduction in symptoms of eczema after 12 weeks. Researchers believe that these effects may be due to fish oil’s ability to reduce leukotriene B4, an inflammatory substance that plays a role in eczema. Psoriasis is an inflammatory condition which Psoriasis is an autoimmune disease typically caused by inflammation due to stress, environmental factors or infection. The most common symptoms are dry, itchy, scaly patches and currently, there is no cure, but symptoms can be alleviated. Omega-3 fatty acids are anti-inflammatory and help remind the body to turn inflammatory reactions off when they are no longer needed. Gamma Linolenic acid (GLA ) is technically an omega-6 fatty acid, but it behaves more like an anti-inflammatory omega-3. Eskimo Brain is rich in both omega-3 and Omega-6 GLA. According to the National Psoriasis Foundation, fish oil can aid in preventing or slowing heart disease, which is especially great for psoriasis and psoriatic arthritis sufferers who are at a higher risk of developing heart disease. We have been featured on IrelandAM as part of feature by the fantastic Jennifer Rock “The Skin Nerd”. It’s great to hear Omega-3s featured as part of a regime to achieve optimum skin health. There is often a need to heal from the inside – out, alongside your daily routine. 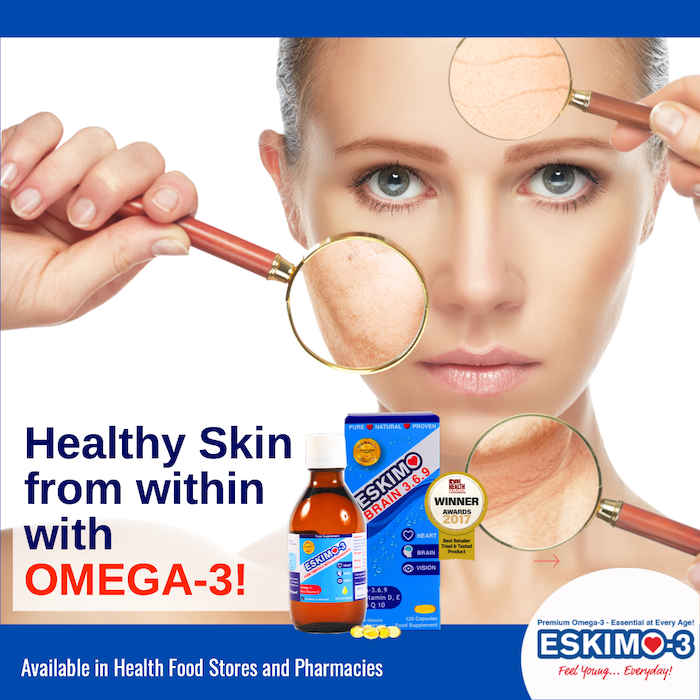 Eskimo-3 is available in health stores and pharmacies nationwide and at Eskimo3.ie!